McIlroy spun his approach into the Swilcan Burn at the frst and took six before dropping another crucial shot at the 17th, where he putted into the Road Hole bunker. A four under 68 left him a shot behind fairytale winner Oliver Wilson, the 34-year old former Ryder Cup player who was a nine-time runner-up on The European Tour between 2006 and 2009, reaching the top 50 in the world before losing his card at the end of 2012. He started the week outside the top 100 on the Challenge Tour and 792nd in the world but took full advantage of a sponsors' invitation, coming home in three under for a 70 for a 17 under total and a cheque for €625,787. Wilson even had to endure a nervous moment on the 18th green as England's Tommy Fleetwood missed a six footer to force a playoff. But there was no hiding Wilson's emotions as Fleetwood's putt slid by the cup. “I don’t have words for it," Wilson said, choking back the tears. "It’s been ten years, 11 years coming. There were nine runners-up and I hadn’t done a whole lot to lose those, but nothing had really gone my way and this week, to be given a big opportunity by Dunhill to play – I can’t thank them enough to give me an opportunity to do this – I guess it’s what golf’s all about. “Before I went out today I thought about how I’ve never gone out and won a tournament. I’ve played alright coming down the stretch and not lost it and other guys have just got over the line ahead of me and today I was just trying to be patient. “I got off to a good start ball-striking wise but a couple of three-putts and you think ‘here we go’ but I stayed patient. The course was tricky with the wind, Rory was in front and I could keep an eye on what he was doing and Tommy was playing good as well. “I played some great shots on the back nine, you feel like when you turn back into the wind that your opportunity has probably gone because it’s hard to make some birdies. ”I made a great save at 14 and the shot I hit into 16 was probably the best shot of my life. 17 was hard work and at the last Tommy had putted well and I thought he was going to make that. “When I came into the week I was almost just trying to make the cut! I got going and played good in practice and knew I was capable of putting a good tournament together but you’re never sure if it’s going to happen. 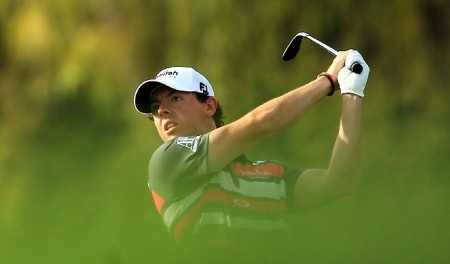 McIlroy was well aware of the fact that he lost the tournament in a small space between the first and 17th greens. “While the 17th hole was a turning point I feel like I cost myself the tournament today was probably in the space of about 20 yards at the front of the green at the first and over at the Road Hole bunker,” said McIlroy. “They’re not too far from each other and they were the two things, the only mistakes that I made all day. “I still love the golf course and I feel like I play well here every time I tee it up, and I’m looking forward to coming back here in July and defending The Open. “It's easy to accept these things when you have two Majors in the bag, you know what I mean, same as the FedExCup, same as everything else that's happened after the summer. It's easy to accept these things when you have played so well and there are a couple of major trophies on your mantelpiece. McIlroy is looking foward to a break now after playing his 11th event in 13 weeks but Lowry, Lawrie and Harrington all have their own goals in mind over the coming weeks. While Lawrie missed the cut by a shot on Saturday, he played brilliantly on Sunday and helped Kieran McManus, son of JP McManus, win the Pro-Am for the second time. He also picked up a "badly-needed" cheque for around €40,000 ($50,000) and heads to the Portugal Masters this week believing his game is close as he battles to save his card. Ranked 175th in the Race to Dubai, Lawrie is more than €150,000 outside the top 110 who will retain their cards. "It gives a little confidence goiing into the last couple of tournaments and the pressure is on once again this year," said Lawrie, who saved his card with a brilliant performance in the final event in Australia last season. "But I am swinging it well and we will see how it goes." 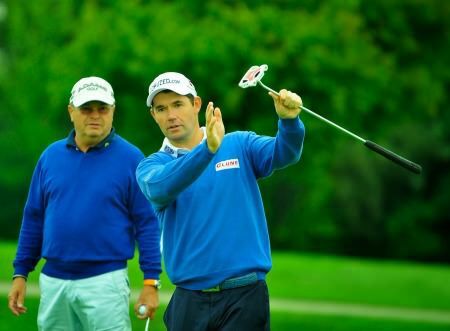 Harrington finished tied for 18th after a 71, seven shots behind the winner, picking up €43,930 to move up to 95th in the Race to Dubai. 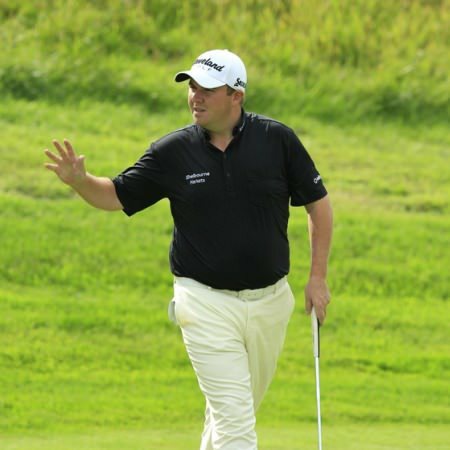 The Dubliner, 43, wants to get back into the world's top 15 over the next two years so he can play in the Olympics but he is still some way short of making the Top 60 in the Race to Dubai who will qualify for the DP World Tour Championship finale. He still has time to make it and will be looking to this week's Portugal Masters as a chance to show that he is recovering from his putting problems, despite another mixed week on the greens in Scotland. 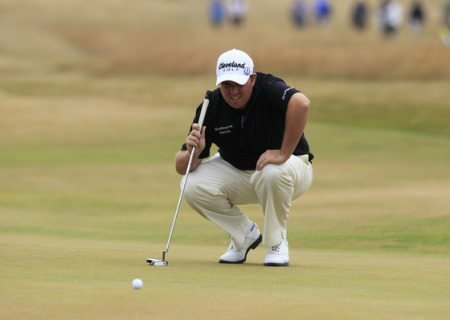 Putting proved costly for Lowry at St Andrews, where he three behind the winner in sixth spot on 14 under after a 67. Starting the day with little momentum having bogeyed his final hole at Carnoustie on Saturday, the Clara man got off to a great start with three birdies in the first five holes. But a sloppy three putt bogey from 12 feet at the sixth, where a two-footer, killed his momentum. When he birdied the ninth and 10th to get back into the mix, he missed another two footer and bogeyed the 13th. And while birdies at the 14th and 17th gave him a cheque for €112,642 that took him to 12th in the Race to Dubai with €1,270,383, he had mixed feelings about his week. As he reflected on the positives of his fifth Top-10 of the season and the haul of world ranking points that take him to the cusp of the world's Top 50, he said: "It's another what-could-have-been week." "It was another decent week and I'm looking forward to getting back to Portugal," Lowry said. Victorious European Ryder Cup captain Paul McGinley shot 70 to finish tied 42nd on seven under. He's entered for Portugal too and while he's opening his new Academy and course redesign at Quinta do Lago on Tuesday, he is not a certain starter at Vilamoura. Rory McIlroy won’t play another event in Europe this year. He’s skipping the Alfred Dunhill Links. Rory McIlroy might be skipping the PGA Grand Slam of Golf but he has also decided to leave the European Tour without one of its biggest draws by opting not to tee it up in next month’s Alfred Dunhill Links Championship for the first time in his professional career.